While there was no fieldwork today, we used this Friday to continue the processing of finds and ceramics. 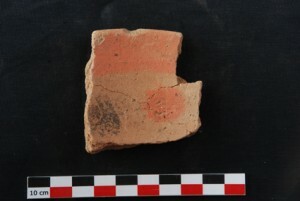 After 4 weeks at SAV1E, a total amount of 12 176 pottery sherds have been analysed – from the total 36 % are 18th Dynasty in date (4375 pieces). Bread moulds, beer jars, dishes and plates are the most common types. The beer jars (cf. picture to the right) are especially numerous and seem to have been made in a local Nile clay variant. 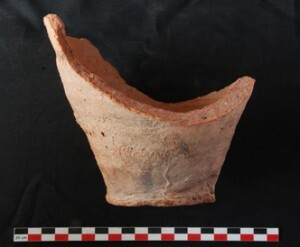 Some of the small dishes found at SAV1E show a nice splash decoration with red paint inside like the rim sherd illustrated here – this pattern is well known from Egypt and predominantly originates from the reign of Thutmose III. Small finds and objects are still rather rare at SAV1E – as reported, we have a number of reused sherds, a clay weight, pounders and other stone tools, especially grinding stones. Some of the latter were found directly in the sandy remains filling the negative outline of the outer walls of Building A. 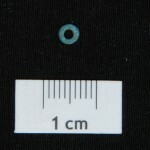 In the north-eastern corner of Square 2, we discovered from the lowest level of bricks a small fayence ring bead, probably of New Kingdom date. All in all, we have traces of grinding, bread making, possibly fishing and storage facilities at SAV1E – typical domestic activities in Egyptian towns, of which some are also commonly associated with temples and cultic activities. With two more weeks of fieldwork in our excavation area, we attempt contextualising SAV1E and its architectural and material remains further. This entry was posted in 18th Dynasty, Archaeology, Material Culture, New Kingdom, Settlement architecture and tagged Material Culture, New Kingdom, Sai Island by Julia Budka. Bookmark the permalink.